I was having trouble with connecting my laptops to a remote display with Miricast. 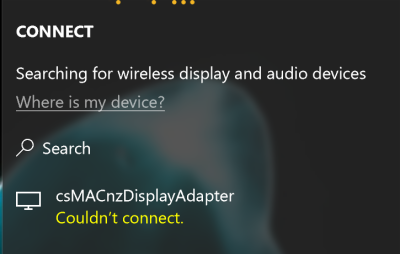 Specifically, I was trying to use the functionality built into Windows 10 to connect to a wireless display and had a Microsoft Wireless Display Adapter V2 plugged into my TV. It would say Connecting to ... for a while and then fail with a message Couldn't connect. I managed to find a support article from Microsoft, which has some great troubleshooting steps to follow. However, these instructions by themselves were not enough. 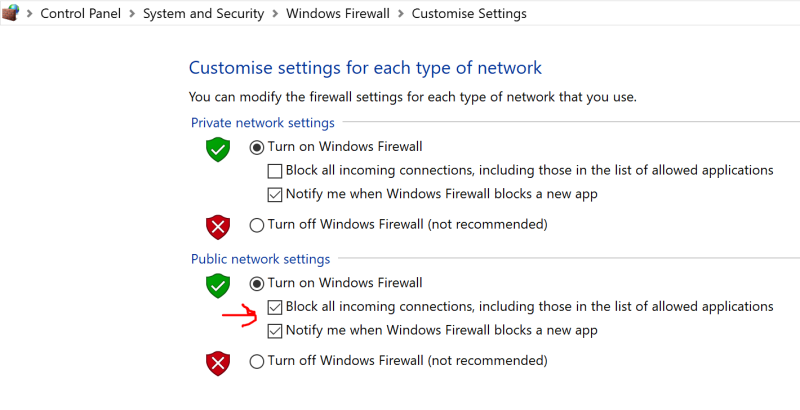 In the Windows Firewall, there is configuration around Blocking incoming connections. A little checkbox says "Block all incoming connections, including those in the list of allowed applications". If you want to be able to connect to a Wireless Display, this needs to be Unchecked, so that the device can communicate back to establish the connection. Depending on your situation, you may need to do this for Both Public and private networks. SECURITY WARNING If you are using your laptop against public network connections, you probably want to turn this back on again when you have finished so that your machine is protected on public networks such as wifi hotspots at Cafes and Airports. Just turn this off while you are connected to your remote displays, at your home or office on the trusted Private networks. There may be a way to establish a trusted Display Adapter as a private network instead, to avoid this issue. I just haven't found one yet. If you do, please let me know!